And the Gods of innovation looked upon all that they had made, and, behold, it was very good. The Garden is now interconnected, it is permanently online, and all information is instantly available anywhere and everywhere. But the fruits are still hand-picked: it befalls to us humans to generate all the information and introduce it into the net, much like the painstaking labor of a farmer who plants the seeds and collects the harvest that he will then deliver to the distribution chain. The big step, the automatic generation of data without the toiling by Man, is still to be taken. That step is the Internet of Things. The Internet of Things would deliver a dream of ubiquitous sensorization. Whether the trees of the Garden need watering, or the ripe fruits collecting, or the seeds planting, the Internet of Things will sense and react to these needs in real time. But this comes at a cost, of course, and the cost is, as always, energy. In tending the Garden, technology has increasingly evolved towards the autonomous nourishing of each individual sensor by attaching it to its own battery. But batteries are highly contaminant energy accumulators that need replenishing and replacing many times over the lifespan of the sensor it is charged to power. The attention required by each individual sensor, among a population of billions, ultimately requires billions of personal visits and billions of items to be scraped (or, in the best case scenario, recycled for a considerable price). Aside from the stringent regulations regarding waste management, a simple economic fact emerges: the more items you have, the more expensive they are to maintain. Having just replaced the manual collecting of information by manual tending of the sensors that collect the information, the ballooning cost of maintenance turns the Internet of Things, into the Internet of Kings. Transport, storage, recharging, and replacement of exhausted batteries thus hinder our expectations of wholesale sensorization. To look away from this problem is akin to one of the most denied, and commonly practiced, strategies for washing the dishes: flush the small solids down the drain! But the truth comes out, sooner or later, when the plumber has to be called to clear the clogged pipe, for which we deny responsibility. 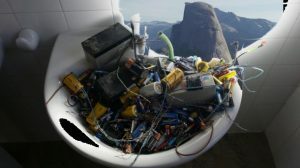 Here the garbage that we are flushing down the drain is particularly thick: not only ballooning costs are sinking the benefits, but the batteries are generating real waste that is toxic to the Garden. If we do not face the problem before the pipes get clogged, the progress we desire will drive us towards an Internet of Sinks. Two complementary strategies are currently being developed. One comes revisiting a simple idea that is more than a hundred years old: let’s plug in the devices! Most sensors are fixed, and for those it will undoubtedly be more economically and environmentally sustainable to have them wired than it is to have them battery-fed. This is already done in solutions such as SpinWire®, where the cable is the device. But, for sensors that are mobile – think biomedical chip implants – cable is not an option nor is surgery every time we need to replace the battery! Here is where we must deploy the second strategy: energy harvesting. The development of transducers capable of converting motion, heat or light into electricity usable by a sensor is now as important, if not more so, as the development of the sensors themselves. In whichever scenario, wireless devices would benefit of coupling to a nearby network of devicables. Wireless alone still suffers from energy and ecology tolls in the highways towards instantaneous and reliable big data. By combining wires, waves and sustainable-energy harvesters, we hope to realize a dream in which Smart Cities become Smart Gardens. Dr. Xavier Martí * and Prof. Gustau Catalan work at the Institut Catala de Nanociencia i Nanotecnologia. Dr. Matt Rowberry, Dr. Xavier Martí and Prof. Tomas Jungwirth are researchers at the Academy of Sciences of the Czech Republic. Dr. Andreu Veà ** is President of the Board at the Internet Society (ISOC-es) and former Stanford University Internet Research Fellow. All are members of the scientific advisory board of IGSresearch.